The Smart Sensor/Director demo kit is a complete color tuning luminaire reference design solution, built around the AS7225 smart-sensor enabled lighting director. 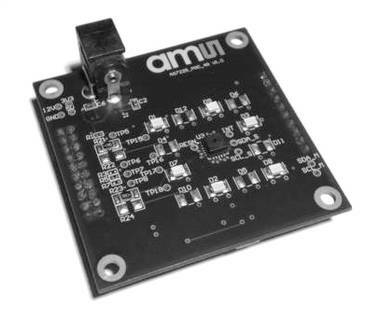 The AS7225 demo kit serves as a self-contained reference design to move developers rapidly from demo to proof-of-concept integration into a prototype luminaire design. The kit consists of a mezzanine style PCB which includes the AS7225 Smart Sensor/Director, warm/cool LED strings for tunable white capabilities, and an on-board 8051 microcontroller that interfaces to the graphical user interface and LED strings, and executes the color tuning directives. The mezzanine connectors enable fast breadboarding, or easy creation of a compatible reference design. Signals on the connectors include I2C which would be routed to an alternate host microcontroller, PWM lines up to the mezzanine board FETs for LED control, and an 8051 disable signal in support of a microcontroller base board. The kit includes a diffuser, USB to serial interface cable, and power supply with US/European adapter. The included memory stick includes complete user documentation, GUI and drivers.